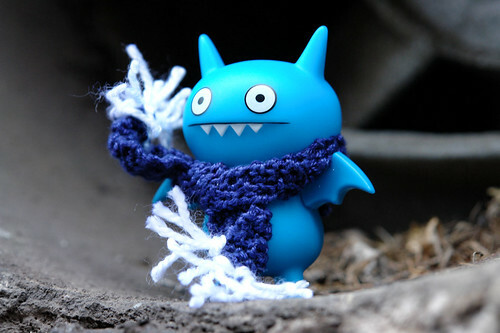 Uglyworld #17 - Icebat Feeling Cold, originally uploaded by www.bazpics.com. This morning when we work up we could hear sneezing and coughing coming from downstairs and wondered what was going on. When we got to the living room we found Icebat sitting on the couch with a cover over him and a cup of hot Lemsip in his hand. With us planning to head to the Extraschicht event at the Landschaftspark in Duisburg from 6pm-2am I asked him if he wanted to stay at home? Icebat replied quickly and sharply with a resounding "NO! ", and then produced a scarf which he said Mireille had knitted specially for him and would keep him warm through the night in Duisburg. Uglyworld #89 - "Look, it's a b-OX-ter"
Uglyworld #79 - With Ice Or Without? Uglyworld #50 - Look What We Made, Pizza !!! Uglyworld #33 - What The Hell!! !